*These authors equally contributed to these results. Among the different models developed to understand the biology of inflammation in ulcerative colitis (UC), the model of colitis induced by Dextran sulfate Sodium (DSS) is the most used because of its simplicity, its cost effectiveness and similarity with ulcerative colitis in humans. It´s known that DSS can change the expression of some genes. The aim of this work is to know the changes in the expression profile of Ulcerative Colitis Disease (UCD) related genes in the colon of rats treated for 5 days with 8% DSS, in order to better characterize this model. The workflow consisted in the biopsy collection from distal colon, followed by total RNA extraction and analysis of gene expression by quantitative RT-PCR (qPCR) of 55 genes related to inflammation, epithelial integrity, oxidative stress, as well as proliferation and differentiation cellular. Sixty percent of the analyzed genes change their expression with statistically significance, 5 genes were upregulates and 28 genes were downregulates. The upregulates genes are related with inflammation and oxidative stress. The downregulates genes are related with the integrity of the epithelial barrier and also with cellular proliferation and differentiation, both process involved in the intestinal epithelial renovation. These results support the use of this animal model in the development of new drugs against ulcerative colitis. Keywords: dextran sodium sulfate, ulcerative colitis disease, animal model, qPCR analysis. Entre los diferentes modelos desarrollados para comprender la biología de la inflamación en la colitis ulcerosa (CU), el modelo de colitis inducido con dextran sulfato sódico (DSS) es el más utilizado por su simplicidad, su costo y similitud con la colitis ulcerosa en humanos. Se sabe que DSS puede cambiar la expresión de algunos genes. El objetivo de este trabajo es conocer los cambios en el perfil de expresión de los genes relacionados con la enfermedad de colitis ulcerosa en el colon de ratas tratadas durante 5 días con de DSS al 8%, con el fin de caracterizar mejor este modelo. El flujo de trabajo consistió en la recolección de biopsias del colon distal, seguida de extracción de ARN total y el análisis de expresión génica mediante RT-PCR cuantitativa (qPCR) de 55 genes relacionados con inflamación, integridad epitelial, estrés oxidativo, así como proliferación y diferenciación celular. Sesenta por ciento de los genes analizados cambian su expresión con significación estadística, 5 genes aumentaron su expresión y 28 genes estaban disminuyeron en su expresión. Los genes con elevada expresión están relacionados con la inflamación y el estrés oxidativo. Los genes con expresión disminuida se relacionan con la integridad de la barrera epitelial y también con la proliferación y diferenciación celular, ambos procesos implicados en la renovación del epitelio intestinal. Estos resultados apoyan que este modelo animal pueda ser usado en el desarrollo de nuevos fármacos contra la colitis ulcerosa. Palabras claves: dextran sulfato sódico, enfermedad de colitis ulcerativa, modelos animales, análisis por RCP cuantitativo. Ulcerative Colitis (UC) is a multifactorial disease of complex etiology that is not yet fully deciphered. In order to have a molecular evidence for the effectiveness of DSS in generating an experimental model of UC in rats, we explored by qPCR the gene expression profile of 61 IBD related genes in biopsies taken from distal colon of rats treated with DSS. Ten male Wistar Rats weighing 300-400 grams were divided randomly into two equal groups (n=5). The animals were housed in specific pathogen-free conditions according to the Guide for the Care and Use of Laboratory Animals. 14 Colitis was induced by adding 8% DSS 40KDa (Applichen, Germany) to drinking water, ad lib., during five days. (Fig 1). Rats from day 0 and 6 were sacrificed and tissues from distal colon were collected. The tissue was longitudinally cut and preserved in RNAlater ® Solution (Ambion, AB apply Biosystem, USA) for RNA isolation. Figure 1: Workflow: from treatment of rats with DSS until qPCR analysis. Samples were processed on a Tissue Lyser unit (Qiagen, Hilden, Germany), extracting total RNA with RNeasy® Plus (QIAGEN GmbH, Germany) using the Quiacube platform. RNA purity and yield were determined using a NanoDrop Spectrophotometer (NanoDrop Technologies, USA), and RNA integrity number (RIN) was determined using a Bioanalyzer (Agilent, 2100, USA). First-strand complementary DNA (cDNA) was synthesized from 1µg total RNA using Superscript III First-Strand Synthesis Supermix for RT-PCR (Invitrogen Technologies, Carlsbad, California, USA) and oligo-dT primers following fabricant´s instructions. The primer3 web application was used to design 26 qPCR primers with a length of 22 bases and an average GC content of 50% (table 1).15 Genes as: GAPDH, MAP2K5, MAPK6, RPL13A and YWHAZ were selected and tested as reference, due to the stability of their transcription levels across the entire sample set. We employed real-time PCR to analyze gene expression levels in colon samples of animals treated with 8% DSS (GII) vs. untreated (GI). A total of five biological replicates from each group were included, using also three technical replicates per gene. 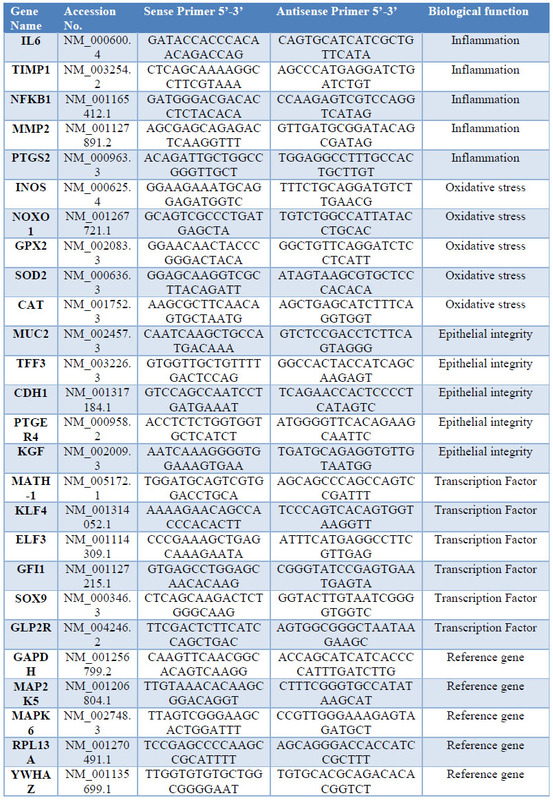 Table 1: Primer sequences used for q PCR analysis, of genes related with inflammation, oxidative stress, Epithelial Integrity, transcription factors involved in differentiation of intestinal epithelial cells (IEC) and reference genes. The qPCR was performed in Light Cycler 480 (Roche, Germany), following the protocol: Real time PCR for RT2 profiler PCR array format C, in 96 well plates of EGF / Pdgf signaling pathway (cat: PARN040Z, Quiagen, Germany). The standardization experiments of the qPCR, the evaluation of reference genes as well as the differential expression of the interest genes was performed simultaneously using bioinformatic package RT2 profiler PCR Array Data Analysis version 3.5 (Qiagen GmbH, Germany). In all cases, Changes in expression were considered statistically significant when the P value is less than 0.05. Eight of the ten genes related to inflammation and oxidative stress increased their expression, five of them did so with statistical significance (IL-6, TIMP1, NFKB, INOs and NOXO1) (figure 2A.). The five genes involved with the integrity of the epithelial barrier decreased their expression, two of them significantly (TFF3 and PIGR) (figure 2B). With respect to the genes related to the cell differentiation process, a significant decrease in the ELF3 and KLF4 transcription factors of the Wnt / catenin β pathway was observed (figure 2C). In relation to the genes that regulate the activation of catenin β, a statistically significant decrease was observed in five genes of the PI3K-AKT pathway and the CNSK2B gene of casein kinase (figure 2D). On the other hand, there was a general decrease in the expression of the genes of the growth factor pathway, being statistically significant in eleven of them (EGF, Pdgfa, Pdgfb, Gab1, Bcar, Nck2, RAP1A, RAFa1, MAPK1, MAPK3 and MAPK9) (figure 2E). 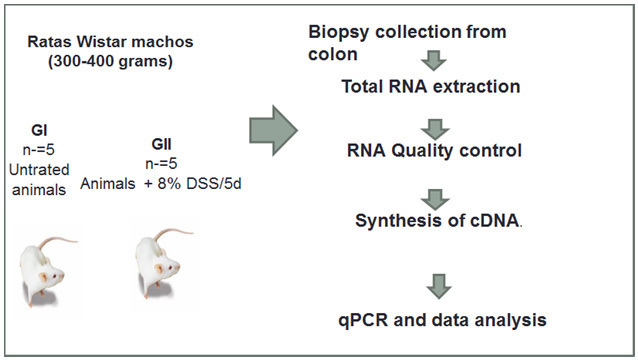 Figure 2: Level of gene expression in colon biopsies of DSS-induced colitis evaluated by qPCR Data is represented as Log2 expression ratio of GII (DSS treated) vs GI (control rats). The genes evaluated are related to: A) Inflammation and oxidative stress B) Epithelial barrier formation C) Transcriptional factors of the Wnt / Catenin β pathway D) Regulator of Catenin β activation E) Pathway of growth factors. Asterisks denote statistically significant changes in expression. The increased expression of genes related to inflammation and oxidative stress, suggest the existence of these processes in the colon of the animal model (figure 2A). Therefore, decreased expression of the TFF3 and PIGR genes (figure 2B) could compromise the integrity of the epithelial barrier, a key factor in the development of ulcerative colitis. The intestinal epithelium is in constant renewal, from the intestinal stem cells (ISC), residents in the crypts of the intestinal epithelium 6. The Wnt / β-catenin pathway is one of the fundamental pathways in the differentiation of intestinal cells. The PI3k / AKT pathway phosphorylates and inactivates the enzyme glycogen synthase kinase 3β (GSK3β), which is an inhibitor of β-catenin. 7,8 On the other hand, the CSNK enzyme phosphorylates α-Catenin, forcing it to release β-Catenin. 9 In both cases, β-Catenin accumulates in the cytoplasm and enters the nucleus, activating the Wnt pathway. Five of the genes analyzed from the PI3K pathway and the CSNK2B gene showed a statistically significant decrease in expression (Figure 2D), which could imply a decrease in the activation of β-catenin. All this is in correspondence with the statistically significant decrease in the expression of transcription factors of the Wnt pathway, KLF4 and ELF3 (Figure 2C), involved in the differentiation of goblets cells and therefore could explain the decrease in expression of the MUC2 and TFF3 genes, both expressed by goblets cells. 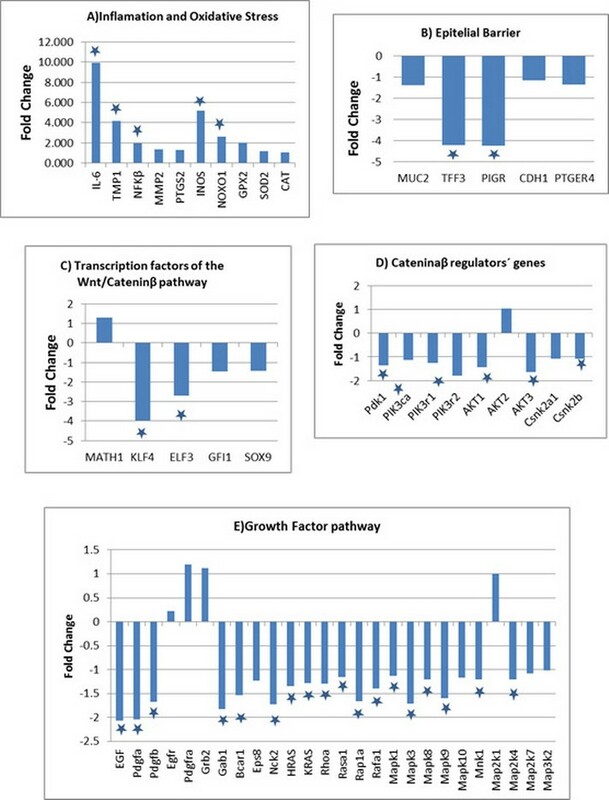 In general it could be said that the pathway of growth factors is downregulated (Figure 2E), due primarily to the decreased expression of the EGF, PDGFA and PDGFB genes, together with a statistically significant decrease of 6 genes that encode proteins that participate in signal transduction, such as: GAB, BCAR1, EPS8, NCK2 HRAS and KRAS. 18, 19, 20, 21 It was also observed a decrease in the expression of most of the analyzed genes of the MAPK family, two of them with statistical significance (MAPK3, MAPK9). As a whole, all these changes in the expression profile could affect the restitution of the intestinal epithelium and thus favor the development of colitis. This animal model reproduces colitis at the molecular level, and could be a useful tool in the validation of new therapies against it. 3. Tytgat KM, Opdam FJ, Einerhand AW, Büller HA, Dekker J. MUC2 is the prominent colonic mucin expressed in ulcerative colitis. Gut. 1996; 38: 554-563 DOI:10.1136/gut.38.4.554. 4. Aamann L, Vestergaard EM, Grønbæk H. Trefoil factors in inflammatory bowel disease. World J Gastroenterol. 2014; 20(12):3223-3230. DOI:10.3748/wjg.v20.i12.3223. 5. Johansen F-E and Kaetzel CS. Regulation of the polymeric immunoglobulin receptor and IgA transport. Mucosal Immunology.2011; 4:598–602; DOI:10.1038/mi.2011.37. 7. Van der Flier LG and Clevers H. Stem Cells, Self- Barker and Differentiation in theIntestinal Epithelium. Annu. Rev. Physiol. 2009; 71:241–60. DOI:10.1146/annurev.physiol.010908.163145. 8. Grimes CA, Jope RS. The multifaceted roles of glycogen synthase kinase 3 in cellularsignaling. Progress in Neurobiology. 2001, vol65:391–426. 9. Ji H, Wang J, Nika H, Hawke D, Keezer S, Ge Q, Fang B et al (2009) EGF-induced ERK activation promotes CK2-mediated disassociation of alpha-catenin from beta-catenin and transactivation of betacatenin. Mol Cell. 2009; vol 36(4): 547–559. 10. Qi Z, Chen YG. Regulation of intestinal stem cell fate specification. Sci China Life Sci, 2015, 58: 570– 578, doi: 10.1007/s11427-015-4859-7. 11. Solomon L, Mansor S, Mallon P, Donnelly E, Hoper M, Loughrey M. et al. The dextran sulphate sodium (DSS) model of colitis :An overview. Comp Clin Pathol,2010, vol 19:235–239. DOI 10.1007/s00580-010-0979-4. 12. Marrero JA, Matkowskyj KA, Yung K, Hecht G, Benya RV 2000 Dextran sulfate sodium-induced murine colitis activates NF-κB and increases galanin- 1 receptor expression. Am J Physiol Gastrointest Liver Physiol. 2000, 278:G797–G804. 13. Dharmani P, Leung P, Chadee K. Tum or Necrosis Factor- a and Muc2 Mucin Play Major Roles in Disease Onset and Progression in Dextran Sodium Sulphate-Induced Colitis. Plos One,2011, Vol6(9): e25058. DOI:10.1371/journal.pone.0025058. 14. National Research Council. 2011. Guide for the Care and Use of Laboratory Animals: Eighth Edition. Washington, DC: The National Academies Press. https://doi.org/10.17226/12910. 15. Rozen S, Skaletsky HJ. Primer3. 1998. Available at http://www-genome.wi.mit.edu/genome_software/other/primer3.html. 16. Vandesompele J, De Preter K, Pattyn F, Poppe B, Van Roy N, De Paepe A, Speleman F. Accurate normalization of real-time quantitative RT-PCR data by geometric averaging of multiple internal control genes. Genome Biology. 2002, vol 3(7):research0034.1–0034.11. 17. Arsenescu R, et al. Signature biomarkers in Crohn’s disease: toward a molecular classification. Mucosal Immunol. 2008; vol 1: 399 – 411. 18. Di Stefano P, Camacho Leal MP, Tornillo G,Bisaro B, Daniele Repetto, Alessandra. The adaptor proteins p140CAP and p130CAS as molecular hubs in migration and invasion of cancer cells.Am J Cancer Res 2011; vol 5:663-673. 19. Nishida K and Hirano T. The role of Gab family scaffolding adapter proteins in the signal transduction of cytokine and growth factor receptors. Cancer Sci 2003; vol 94: 1029–1033. 20. Marcus L, Pieper J a n d Janssen O. Nck adapter proteins: Functional versatility in T cells. Cell Communication and Signaling. 2009, vol 7:1. DOI: 10.1186/1478-811X-7-1. 21. Mitin N, Rossman KL and Der CJ. Signaling Interplay in Ras Superfamily Function. Current Biology. 2005; Vol. 15: R563–R574. DOI 10.1016/j.cub.2005.07.010. * These authors equally contributed to these results.